If you do not have Internet Banking or Mobile Banking facility of Kotak Mahindra Bank, you can still generate the PIN online for your ATM/Debit Card. If you order a new debit card and not received your physical PIN then no need to wait for it, you can set PIN online. 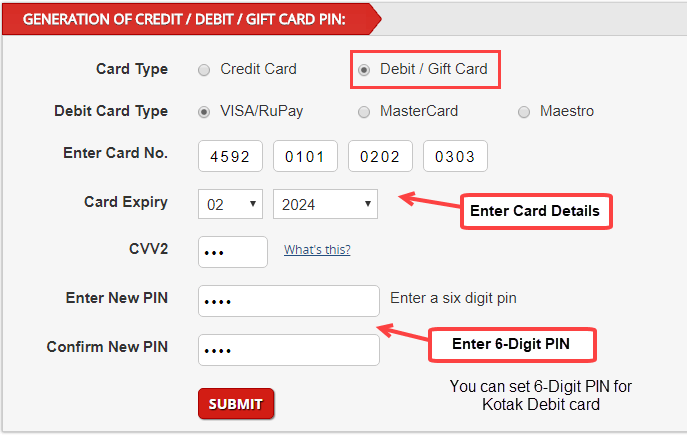 If you are a customer of Kotak Mahindra Bank and want to generate new PIN for your Debit Card, then follow these simple steps and immediately generate your PIN without net banking or mobile banking. 1: First of all visit Kotak Mahindra Bank Instant PIN generation portal. 2: Now select Debit card and enter your card details like card number, expiry date and CVV number. Enter 6-digit PIN of your choice and again confirm it. (For your information you can set 6-digit PIN for your Kotak ATM/Debit card). Set your PIN and click on submit. That’s it, you have successfully generated your kotak Mahindra debit card PIN. You can now use your new card at ATM. So this is quickest method to generate Kotak Mahindra Bank ATM/Debit card PIN online without net banking or mobile banking.